Worked in one piece, starting with yoke. 2nd Row - (Inc Row) (front) ch1, 1sc in base of ch1, * 1trc in next dc, 1sc in next dc, * rpt from * to * to centre dc on 3dc group, 3sc in dc. (sleeve) rpt from * to * to centre dc on next 3dc group, 3sc in dc. (back) rpt from * to * to centre dc on next 3dc group, 3sc in dc. Rpt 2nd & 3rd Rows four more times or until 142dc remain. Pattern Row - ch3, work (2dc, ch2, 1dc) in each ch2 space to end, 1dc in top of ch3. Turn. Rpt Pattern Row until 12 rows have been worked in all or work measures approx 11.5 Inches from shoulder. Turn. Next Row - ch1, 1sc in base of ch1, * (2sc, ch2, 2sc) in next ch2 space, sl st in space between groups, * rpt from * to * to last ch2 space, (2sc, ch2, 2sc) in ch2 space, 1sc in top of ch3. Turn. Fasten off. Row 3 - ch3, work (2dc, ch2, 1dc) in each ch2 space to end, sl st to top of ch3 on beginning of row. Turn. Rpt Row 3 until 8 group rows have been worked in all or under arm sleeve seam measures 5 inches. Fasten off. Row 9 - ch1, 1sc in base of ch1, * (2sc, ch2, 2sc) in next ch2 space, sl st in space between groups, * rpt from * to * to last ch2 space, (2sc, ch2, 2sc) in ch2 space, sl st to first sc on beginning of row. Fasten off. Turn. Button/Buttonhole Bands - With RS of work facing rejoin color 1 to right hand front edge, ch1, 1sc in base of ch1, work 42 more sc evenly in row ends up first front edge, 3sc in corner, work 1sc in each ch around neck, 3sc in corner, work 43sc evenly in row ends down second front edge. Fasten off. Turn. Join in color 2, ch1, 1sc in base of ch1, work 1sc in each sc to corner. Fasten off. Turn. Join in color 1 and rpt last row once. Fasten off. Next Row - Join in color 1, ch1, 1sc in base of ch1, 1sc in each sc and ch2 space to end. Fasten off. Flower Motif - Click here for the flower motif. Car Motif - click here and scroll down the page for the car motif. 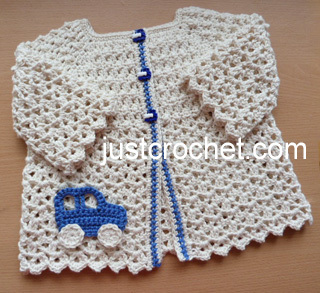 Finishing - Close small gaps under arms, weave in and trim off all loose ends of yarn, attach buttons to correspond with buttonholes, sew on motifs wherever you wish. 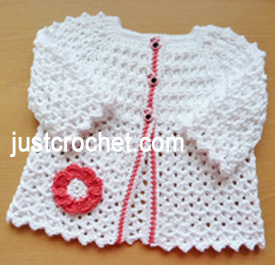 Hope you enjoy this free crochet pattern for a cotton summer cardi.